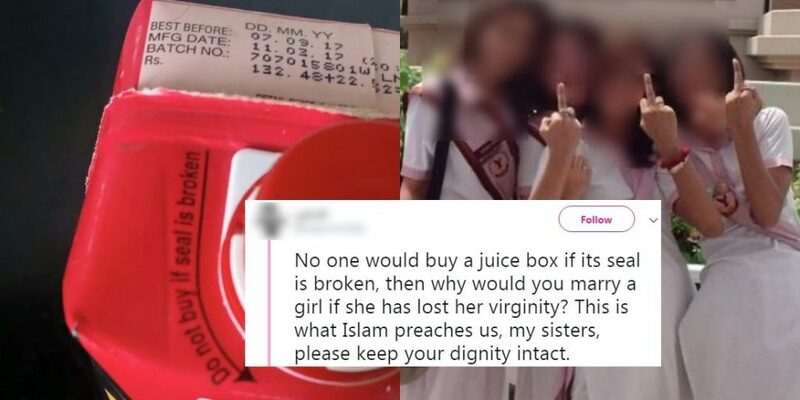 Pakistani Twitter Just Exploded After A Guy Referred To Girls As 'Sealed Juice Boxes' And Astaghfirullah! If there’s one thing that’s constant on Pakistani social media platforms, it’s juicy stories erupting out of thin air. Validating opinions is one thing, but going completely against the ethics of the forum and labeling others for your shortcomings is something else. That is exactly what happened on Pakistani Twitter the other day. Somebody tweeted sharing their opinion about a said point of view, and out of nowhere, it triggered every single female and many men on the forum – resulting in an absolute hullabaloo of astaghfirullah tweets. After this, everything went haywire from there. One by one, people, especially women, started voicing their opinions on the ‘misogyny’ by the person who had made the initial tweet. One person wrote: “What about a juice ka Dabba which was opened legally?? 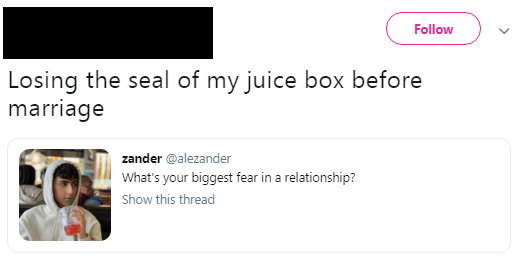 I mean a girl that had a marriage before?” – stating that if a girl had been married before, how would she remain a ‘sealed juice box’? Makes sense. After that, the term ‘juice box’ turned into effortless memes, people sharing how they felt, coming up with witty tweets on the given issue. And the memes kept on rolling, one after the other. The girls, especially took charge, sharing their biggest fears – jokes! This one seemed more fierce and angry – she went on to decipher the state of ‘Pakistani men’ and how they have double standards. Well, some stepped in and defended men as well… cause basically, everyone keeps referring to men as trash! And then there were other misogynists, taking the person’s side, and sharing their own petty views as well. Goddamn! 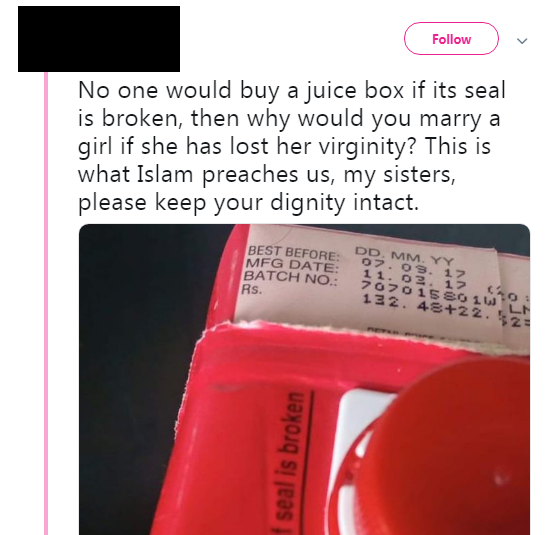 Since we can’t link you to all the people involved in this charade of different opinions over a women’s chastity due to the topic’s sensitive nature, you can just log onto Twitter and just write: “Juice Box” in the search bar and voila, it’s a goldmine!